Chronicling the United States Marine Corps' actions in the Pacific theater of operations, Voices of the Pacific presents the true stories of heroism and honor as told by such World War II veterans as Sid Phillips, R. V. Burgin, and Chuck Tatum-whose exploits were featured in the HBO miniseries The Pacific-and their marine buddies from the legendary First Marine Division. 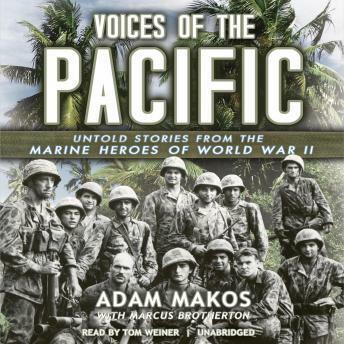 Following fifteen marines from the Pearl Harbor attack and intense boot camp training through battles with the Japanese on Guadalcanal, Cape Gloucester, Peleliu, and Okinawa to their return home after V-J Day, Adam Makos and Marcus Brotherton have compiled an oral history of the Pacific War in the words of the men who fought on the front lines. With unflinching honesty, these marines reveal harrowing accounts of combat with an implacable enemy, the friendships and camaraderie they found-and lost-and the aftermath of the war's impact on their lives. With unprecedented access to the veterans and unpublished memoirs, Makos and Brotherton have forged Voices of the Pacific into an incredible historic record of American bravery and sacrifice.